Seventy-three percent of Republicans in a Pew Research Center study say the media does not understand them. The study, released last Friday, found that Republicans surveyed felt misunderstood by the media, regardless of demographic traits and media consumption habits (how much news they read). Across the aisle, 40% of Democrats in the survey felt misunderstood, while 58% felt understood by news organizations. Democrats' feelings toward the news media were affected by the amount of news they consumed. About 27% of Democrats who are very interested in the news feel misunderstood, compared with 39% of those who are somewhat interested and 52% of those not interested. There are also differences in Democrats' attitudes when education and age are compared. About 29% of Democrats surveyed with at least a college degree feel misunderstood by the news media, compared with 42% of those with some college education and 47% of those with a high school diploma or less. 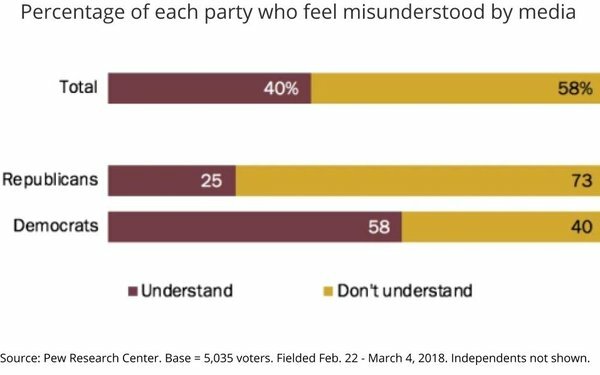 Democrats ages 50 and older are also less likely to feel misunderstood than those under age 50 (35% versus 44%). Overall, 58% of U.S. adults feel the news media do not understand "people like them," compared to the 40% who feel they are understood. Some legacy publishers are making efforts to include conservative voices in their pages. The New York Times launched a political podcast last fall called “The Argument,” hosted by three Opinion columnists with opposing political opinions: Ross Douthat, Michelle Goldberg and David Leonhardt. Pew surveyed 5,035 U.S. adults over two weeks in February and March 2018 for the study. On the TV front, Sinclair Broadcast Group is known for its conservative editorial voice. But in February, it is adding a liberal commentator to its news operations. Ameshia Cross, a self-described progressive activist and advocate who worked on President Obama’s 2012 re-election campaign, will host a new daily commentary segment.